Peter Lougheed Provincial Park is a premier year-round destination set amongst the soaring peaks and serene glacial filled lakes of the Canadian Rockies in Kananaskis, Alberta. The park has over 500 square kilometres of striking wilderness and is located just south of the Kananaskis and Spray Valleys. Over the holidays, we were looking into nearby cross country skiing areas and came across an article listing Peter Lougheed as one of the top rated spots in Alberta. We were stoked to learn about the area's 85 kilometres of cross country ski trails of varying difficulty and began planning our route of exploration. We decided on a 16-kilometre loop that began at Boulton Creek campground on the Whiskey Jack trail, connected to the Lookout trail and circled back via the Hydroline, Fox Creek and Moraine trails. For a map of the regions trails including descriptions, difficulty levels and distances, check out this handy online brochure from Alberta Parks. We chose the Lookout trail in hopes of finding a nice viewpoint of the region but didn't realize the name was short for the Kananaskis Fire Lookout, which meant an unexpected elevation gain of more than 400 meters. We naively started the day at an energetic pace but started to considerably slow down as the incline increased. Soon enough, expert nordic skiers starting whizzing past us up the mountain and we honestly began to think we had found ourselves on an Olympic training course. Still hoping for the lookout point, we continued awkwardly waddling up the hill on our not-sharpened-since-the-80's nordic skis. What rookies, right? After two hours of climbing, we came across a small opening in the trees with a narrow but spectacular view of Upper and Lower Kananaskis Lakes. Completely exhausted, we threw down our packs and took a moment to enjoy the scenery. Several minutes later a skier blew past us without stopping and we remarked that it's unfortunate how Olympic skiers don't have time to enjoy the view. No less than five minutes up the trail, we came across the actual lookout and smiled as we stood beside the skier who whizzed past us 10 minutes earlier. It turns out Olympic skiers do take breaks. 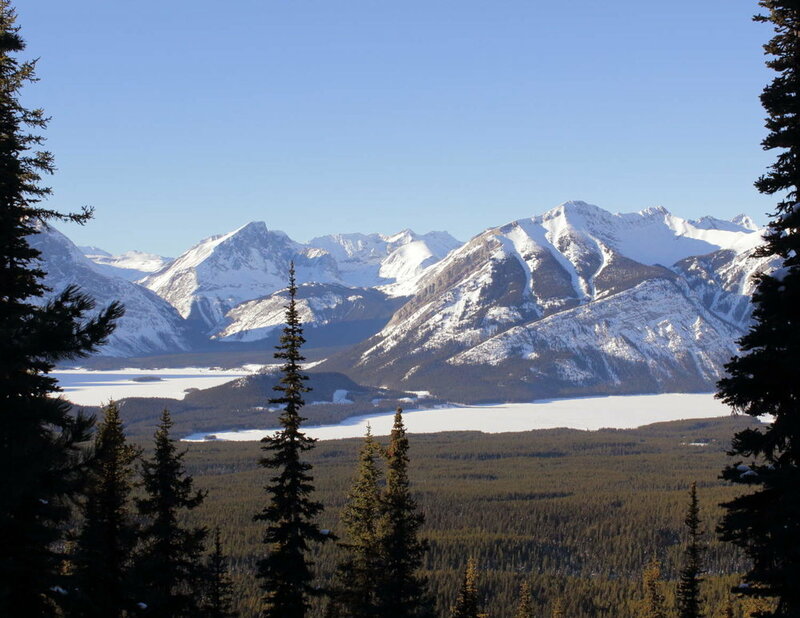 The fire lookout provided a complete panorama of Peter Lougheed Park including both Upper and Lower Kananaskis Lakes and stretched as far up the valley as one could see. It was truly a spectacular sight. While trying to take a photograph, Ben managed to get himself into a small struggle with his skis (and the waist deep powder he fell in). At that same moment, he was approached by a very nice gentleman who offered to take a look at the skis to spot the problem. After politely explaining that the skis were not the problem, we recognized him as the local cross-country skiing guru, SkierBob. We enjoyed a nice conversation about the beautiful conditions and posed for a few photos which he was kind enough to feature on his website. Even for two alpine ski coaches, we knew that the ride down would be a formidable test of leg strength (and perhaps courage). Abandoning all proper skiing technique, we ripped down the trail in the purest pizza form, digging the dull inside edges of our skis into the snow. After a thrilling drop in elevation, we linked up with the Highline Trail, a clear-cut path through the trees that ran along a power line. This easy going trail provided an incredible vista of Mount Indefatigable blanketed in golden rays of the late afternoon light. We eventually dipped back into the trees and connected with the narrow and charming Fox Creek Trail. Winding along a trickling creek, the trail was so sheltered under the thick, snow-blanketed forest it was like skiing through a wintery tunnel. All we could hear was the dampened squeaks of our skis as we glided past fallen logs buried under mounds of snow. The last leg of our loop was the Moraine Trail, which meandered along the mountainside through thin alpine until it connected back with Boulton Campground. Exhausted after an epic day on the trails, we were pretty excited to see the car waiting for us in the parking lot. Even so, we were already planning a return trip before we even pulled out of the parking lot. If you want to head out on your own, here is a link to a handy tool with directions to the park no matter where you are coming from. For more information on activities in the Peter Lougheed Provincial Park, check out their website here.